We slept through the media breakfast at Brennan’s and managed to rouse our carcasses (“Quiet darling, your Auntie Mame is hung”) to get to one of the most-anticipated seminars of my schedule: “Amore Amari: A Very Bitter History of Bitter Spirits in Apertif Service and Cocktails,” presented by Averna, Campari and The Bitter Truth. Wesly and I have been mad for bitters for years, obsessively collecting as many varieties as we could (including our best score ever — three pristine, full 18-ounce bottles of Abbott’s Bitters), and over the past year or so have become amaro fanatics as well — the bitterer the better. Eric Seed of Haus Alpenz led the panel and began by talking about the history of bitters in cocktails, and how up until the beginning of the 19th century bitters were truly strictly medicinal, and medical miracles were attributed to their regular use. 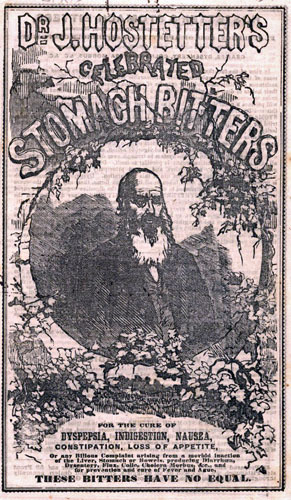 Our favorite of the historical ads that they showed were for Hostetter’s Stomach Bitters, the makers of which exhorted you to “Renew Vigor and Make Life Worth Living!” Hostetter’s also helped you “renew your life-giving blood currents” and took care of your dyspepsia, malaria, indigestion, fever and ague, nervousness, kidney, bladder and bowel disease, neuralgia, rheumatism, menstrual cramps and hysteria. While I can’t vouch for most of those claims, bitters then and now are great for indigestion and overindulgence, and many of us have but a few teaspoons of Angostura in soda water to settle our tummies. Gentian-based bitters, which have an almost horseradish-like bitterroot flavor without the burn, include Suze from France and Averna from Sicily, and gentian is also an ingredient in most aromatic cocktail bitters such as Angostura. Cinchona bark, from which we get quinine, is the bitter agent in tonic water as well as in quinquinas, aperitif wines like Lillet, Dubonnet and bitters such as Amer Picon. Citrus bitters are sought for their flavor, aroma and sweetness as well as the bitter components. They make very popular amari (Campari, to name the most popular, and it’s “younger brother” Aperol), as well as beloved cocktail bitters such as the wealth of orange bitters we’re able to enjoy now from Fee’s, Regans’, The Bitter Truth, Hermes and the wonderful new Angostura Orange Bitters. LeNell Smothers also spoke about her massive collection of bitters at her shop in Brooklyn (and I’m preparing a frighteningly large order for her), and Stephan Berg of the wonderful new bittersmakers The Bitter Truth came from Germany to speak of his products and also regale us with some wonderful history of Angostura and Abbott’s Bitters. This Negroni variation is heavier on the vermouth (we like the variation called the Cinnabar Negroni, which doubles the Campari), and a bit of dry apricot brandy (the lovely Marillien that Eric’s Haus Alpenz imports) also adding fruit flavor without the potential of overly cloying sweetness from too much liqueur. This reminds me of a drier, more bitter Martinez. A Daiquiri variation, again demonstrating that a little liqueur can go a long way flavorwise. Here we have only 1/4 ounce of Eric’s new product, St. Elizabeth’s Allspice Dram, and it lends great character and spice to the drink. The Averna gives it a lovely bitter component, with the sparkling wine lightening it all up. Funny name too, but you do get a sense of kola nut flavor (itself a very bitter ingredient, if you’ve ever tasted one on its own) in this mixture of flavors with the most well-known Sicilian amaro. I’d be happy to smell like that (and taste all those wonderful tastes) every day!